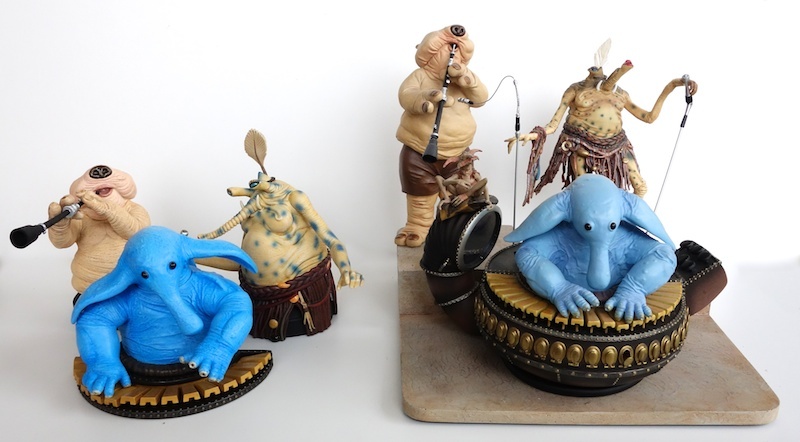 This is the third and final piece in Gentle Giant’s series of Rebo Band mini-busts, after the Sy Snootles and Droopy McCool busts that were released a few weeks ago. I’m not sure why they didn’t release them all at the same time. Even stranger is the fact that his edition size is apparently only 750, while Sy Snootles was 850 and Droopy McCool was 900. 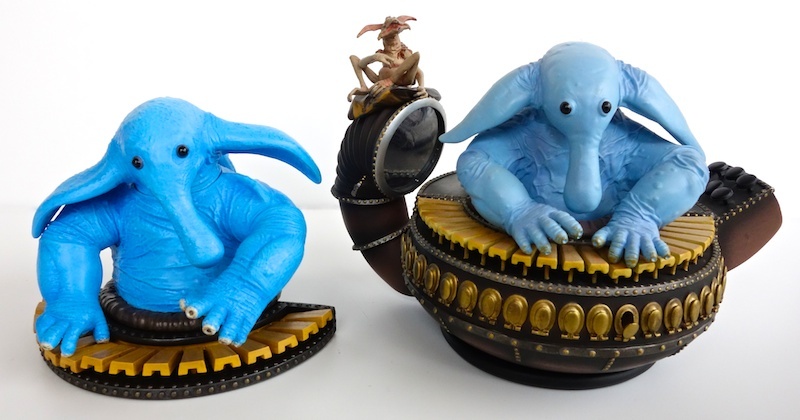 I would think most people buying these will be getting all three, and if someone were to only get one I would think Max Rebo would be the one to get. So I have no idea why his edition size is the smallest of the three. 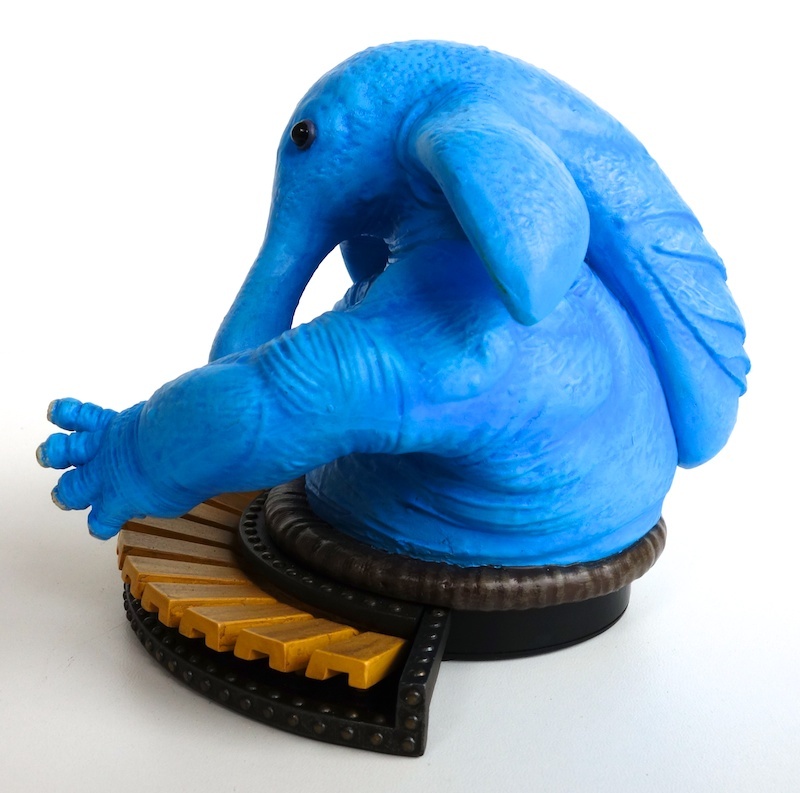 Since the character of Max Rebo is inseparable from his piano, it’s understandable that they decided to include it — or rather part of it — in the bust. It looks a little odd, but I guess it’s better than not having it. Gentle Giant has already released a full statue of the Rebo Band in a slightly smaller scale, so it’s natural to want to compare the two. These busts are supposed to be 1/6 scale, while the statue is probably 1/7 or 1/8. 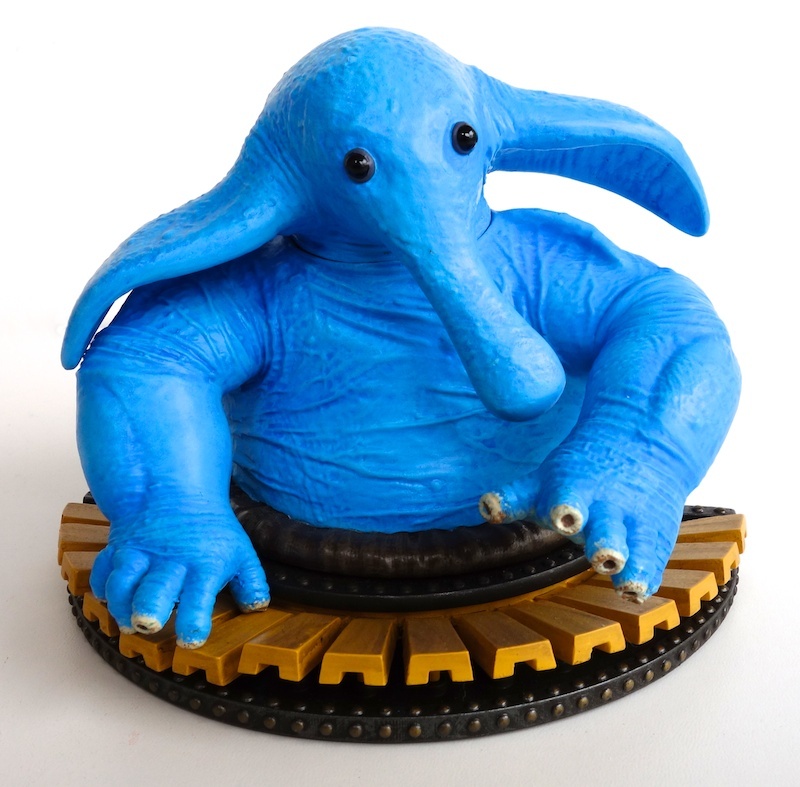 When I first got the mini-bust in hand, I thought it seemed rather large but when you put him next to the Max Rebo statue, the difference is barely noticeable. What is noticeable is the difference in color. The mini-bust is a lot more blue, and I think it’s the more attractive of the two pieces in that regard. There’s also more detail on the skin, etc. However, not having the entire piano is a major liability for the mini-bust, so I’ll have to give the edge overall to the statue. The same can be said for the band as a whole. If you compare the mini-busts with the statue, it seems to me that the statue is the clear winner. While the busts are a bit bigger and more detailed, they are (unsurprisingly) missing their lower halves, and that makes them less impressive overall than the full statue. The mini-busts are also a lot more expensive than the statue. I’ve seen the statue sell for not much more than the price of a single one of the busts! Unless you’re a fanatical Rebo Band fan (guilty as charged!) or have a large collection of mini-busts and you want to stick with that scale and style, I see no reason to get the busts over the statue.